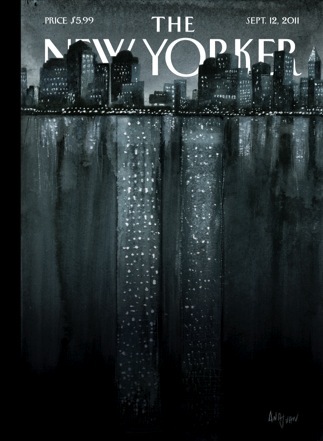 Last weekend, I tried to think of something to write about 9/11. I couldn't come up with anything. A boy who played on my younger son's baseball team for two years lost his father in 9/11. Whenever that sweet-looking, blonde child went up to bat, I thought of his loss and what his mother had gone through. Compared to him, I had nothing to say. Then I read Colum McCann's essay in the September 12 issue of The New Yorker. McCann is the author of Let the Great World Spin, one of the most beautiful short story collections I've ever read. McCann calls the book a novel but it's really a book of interconnected short stories, with characters who know each other and wander in and out of each other's lives. The one event that connects them is that they all saw or heard about the tight rope walker, Philippe Petit, who lay down a wire and walked between the Twin Towers in August 1974. In The New Yorker essay, entitled "Dessert," McCann describes watching a woman on the East side eat a slice of chocolate cake the day after the Twin Towers came down. The woman eats slowly and deliberately, and McCann is appalled that anyone can eat dessert the day after such a catastrophe. "The woman unrolled a fork from a paper napkin, held it at her mouth, tapping the tines against her teeth. She ran the fork, then, through the powder, addressing the cake, scribbling her intent. Our job is to be epic and tiny, both." "I still have no idea---after a decade of wondering---whether I am furious at the woman and the way she ate chocolate cake, or whether it was one of the most audacious acts of grief I've seen in a long time." After reading that essay, I thought about how and why food takes the edge off of tragedy and/or the aversion of it. My family dodged two bullets on 9/11. My brother was near and my first cousin was in one of the Towers when the planes hit. My cousin had a meeting on one of the top floors and stopped on the first floor to go to the bathroom. He ran out of the building as soon as he heard the plane hit. My brother worked a block away. He jumped on a ferry to New Jersey and then took a train to the station near our house. His cell phone wasn't working and we were all frantically wondering where he was when he showed up at our front door. My father drove over and I started taking out cans of tuna fish and mayonnaise, heating up bagels and making everyone lunch. We stood around the kitchen and laughed nervously. My husband was out of town. Our sons were 5 and 1 then, and I remember thinking that if I just kept everyone safe and fed, crammed into one room together, everything would be okay. Of course, that's not true and it's shocking that some people can survive a disaster and go on and eat cake, but I think food and the sharing of it can provide some relief, some of the time. This week, I did what I usually do in early September: I wrote, prepared to start teaching again, made dinner, walked the dog, exercised, drove my kids around, talked to my neighbor. Nothing was particularly difficult. My class was filled, my kids had no pressing issues, the back to school dust was settling. But in the middle of the day yesterday, I had a surge of anxiety. I made a cup of hot chocolate, spiked with coffee grinds, which usually serves well as Mommy's little pick-me-upper but I still felt rattled. I decided to make dinner. It was still early in the day---I had just eaten lunch--and way too early to start thinking about dinner, but I was supposed to interview someone at 4 p.m. and I rationalized that I should start getting dinner early so that I wouldn't have to rush home from the interview and start cooking. But really, I was just looking for a distraction and leafing through old cookbooks and defrosting chicken breasts provided it. 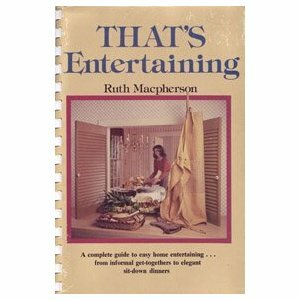 I took down Ruth Macpherson's Food For Friends. Macpherson used to live up the street from me, in a charming Tudor on a busy, main road. The train tracks ran behind her back yard. Shortly after I moved to town, my neighbor gave me Macpherson's cookbooks as a birthday present. Her other books are Discover Brunch and That's Entertaining. They are little spiral notebooks, with soft covers and no illustrations. They're the kind of thing you see in a school, synagogue or church bookstore. Macpherson doesn't break new culinary ground but her books are small blessings. The recipes always work. Her prose is charming, and she writes in an offhand, friendly way that makes you feel she's just dashing this great recipe off and emailing it to you. There is something simple in her approach in that she does not necessarily expect you to have fresh herbs on hand and she never expects you to make breadcrumbs from scratch. She offers practical advice, such as, "You may wish to pass the soup in mugs before sitting down for the main part of this delicious meal." There are all sorts of menus for tennis team luncheons, elegant baby showers and friend's going away lunches, which make the books feel lady-like and a bit anachronistic, but in a lovely, old-fashioned way that works. Her voice is straightforward and comforting. She just knows you'll figure out a way to get the appetizers in the oven before company comes. I used to see Macpherson walking her dogs in the reservation. She wore her hair in pigtails and she was always eager to talk about her dogs, the weather, and whatever was going on in town. A few year ago, I heard that one of her dogs wandered onto the train tracks and was killed. Macpherson sold her house and I don't see her anymore but I still use her recipes and am grateful for her voice. I made her recipe for Lemon and Tarragon Baked Chicken, went to do the interview, and came home. My older son called and said he'd missed the late bus. The late bus is the last bus, which meant at 6 p.m., I had to drive forty minutes round trip to retrieve him. My younger son had a Spanish test the next day and wasn't feeling well. I was not happy but I knew when I got home, I would stand at the kitchen counter where I had stood with my father and brother all those years ago, and spoon buttery crumbs of chicken and tarragon into my mouth. 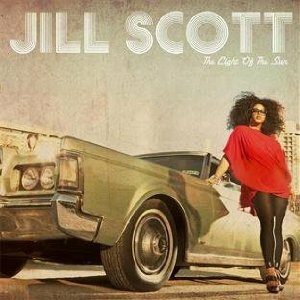 I got in the car, and put on Jill Scott's The Light of the Sun. This album combines feminism, gospel, rap and rock with love and the longing for it. The first song on this gorgeous album is called, "Blessed." Scott sings of wanting to finish recording so she can go home and see her baby boy. She sings of feeling blessed. If we can eat, drive, listen to music, and read, we are too. Preheat oven to 375 degrees. Line baking pan with foil. Melt butter over low heat. Add garlic to butter and saute one minute. Remove from heat and sir in mustardd and lemon juice. Mix bread crumbs, lemon peel and tarragon in a bowl. Wash and dry chicken. Turn chicken breasts in butter mixture to coat, then turn in crumbs, coating completely. Arrange chicken in prepared pan, add salt and pepper. Bake about one hour. Baste, occasionally. If you are using boneless chicken breasts, bake for 50 minutes. I love this, Laura. Reposting on BHC on FB. (assuming you won't mind) Beautifully written.